The Doberman Pinscher originated in Apolda, Germany in the late 1800's. Though the popularity of the breed has spread to many other countries, several common German dog names still rate highly among owners across the globe. Names like Fritz, Klaus, and Dach are highly common and hold true to the breed's roots. Other names borrowed from key people that played a role in the development of the Doberman Pinscher known today include Karl, Louis, Otto, Phillip, and Goeller. Karl Friedrich Louis Dobermann (who lends his name to the breed) is perhaps the most notable participant. Karl was a tax collector that was also in charge of the dog pound in Apolda. His goal was to develop a breed that was ideal for providing protection as he attempted to collect taxes in rough areas. 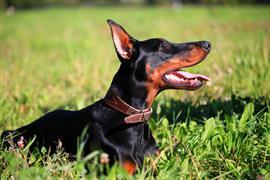 The loyal protective nature of the Doberman Pinscher is still an important characteristic of the breed today. Many owners choose strong names like Bruiser, Samson, or Sergeant. It is easier to feel safe when accompanied by a dog named Bruiser than one named Fluffy. Some of our pages will contain a subcategory. A subcategory is a slightly more specific grouping than the main topic of the page. For a subcategory, we will include a separated table of names and corresponding descriptions. An example of a subcategory of Red Dog Names would be 'Dog Names Inspired by Red Wines'. If you have any subcategory ideas for the Doberman Pinscher Names page, we would love to hear them. Use the form below to submit your ideas.